Police have arrested an Australian national suspected of killing his Facebook chatmate inside a pension house in Dipolog City, Philippines. 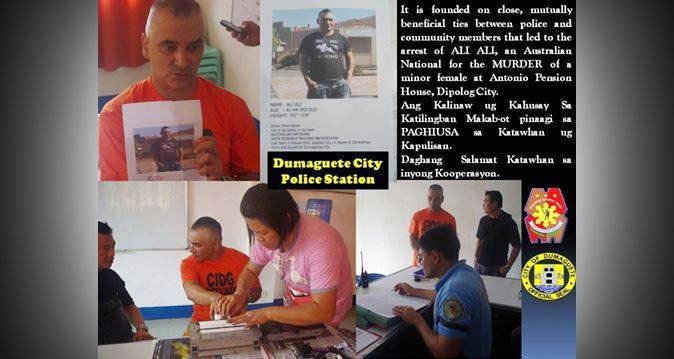 A report posted on the Hulagway ug Kasikas sa Dumaguete Facebook page identified the male suspect as 42-year-old Ali Ali, who came to the Philippines from Australia to meet his Filipina chatmate, a 17-year-old girl from Bago, Sindangan, Zamboanga del Norte. The two reportedly checked-in at Antonio Pension House located at Barangay Central, Dipolog, last Wednesday, January 28. The minor was found dead inside their room at around 4 p.m. on Friday, January 30. Dumaguete City police immediately circulated photos of the suspect and conducted a hot pursuit operation to capture him. At around 11:30 a.m. on Sunday, February 1, a civilian spotted Ali walking along Flores Avenue in Brgy. Looc, Dumaguete City, and quickly called the police. The suspect was arrested after being positively identified. The Australian national was reportedly turned over to the Dipolog City Police Station for custody and formal filing of appropriate charges. A reward was given to the informant. In an interview aired Tuesday night on ABS-CBN's primetime newscast TV Patrol, Ali claimed that what he did to his Facebook chatmate was "unintentional." The murder suspect said he thought she was a transgender.